June 21, 2016 – Hey friends, Chef Morgan coming to you from the ALDI Test Kitchen. It has been a LO-ONG winter here in the Midwest and I am so excited that we are finally getting some warm weather. That means summer will be here before we know it! Summer and fall are my two favorite seasons of the year. I love hanging out on my deck after a long day with a refreshing cocktail, or spending time at friends’ houses, grilling and drinking a few ice cold beers. If you’re anything like me, I like to mix things up every once in a while…literally. Although I don’t have much experience mixing cocktails, I LOVE playing bartender when I get together with friends. I consider myself pretty adventuro us when it comes to food and drink; for me drinking the same old beers or sticking to the same old margarita or mojito gets pretty boring, pretty fast. After all, variety is the spice of life! What’s the cure for the same drab, boring cocktails? The answer is the beer cocktail or “beertail” if you will. I know…many of you might be thinking, “Mixing beer into a cocktail? That will ruin it!” That is exactly what I thought before I tried it. I must say many of these “beertails” are not only surprisingly easy, they’re also quite yummy. Whether you like sweet, fruity cocktails or a heavy, hoppy beer there’s something for everyone. Become the “brewtender” this summer with these simple refreshing concoctions. The most common is the lemon shandy, but shandy can be made with any kind of citrus juice (think lemonade, limeade or grapefruit juice) and cold Belgian Ale or Wheat beer. Mix equal parts beer and citrus juice in a large pitcher, garnish with slices of fruit, stir and enjoy! This is a great way to use up any unused berries taking up space in your fridge. Muddle 2 pints of berries in the bottom of a large carafe or pitcher. Add a chilled 6 pack of Pale Ale, Belgian Ale or Amber Ale, lemonade or lemon juice to taste, stir, enjoy! Like summer in a glass and great for friends who may not like beer. Remove the rind from one small watermelon; cut into chunks. In a blender, combine ¾ cup sugar and watermelon chunks; puree until smooth. Using a mesh strainer, strain into a large carafe or pitcher; add four Belgian Ales or four Amber Ales. A great option for late summer/early fall. Mix 1 part rum, 2 parts apple cider or hard apple cider and 1 part ginger ale, stir. Garnish with apple slices. (An apple a day keeps the doctor away, so mixing it with beer can’t hurt). All of my favorite things in one glass! In the bottom of a glass muddle 2 peach slices. Add 1 part Whiskey/Bourbon, and equal parts chilled IPA and peach nectar. I promise this one won’t hurt a bit! In a tall glass, pour one lager followed by one hard apple cider. So simple and delicious! 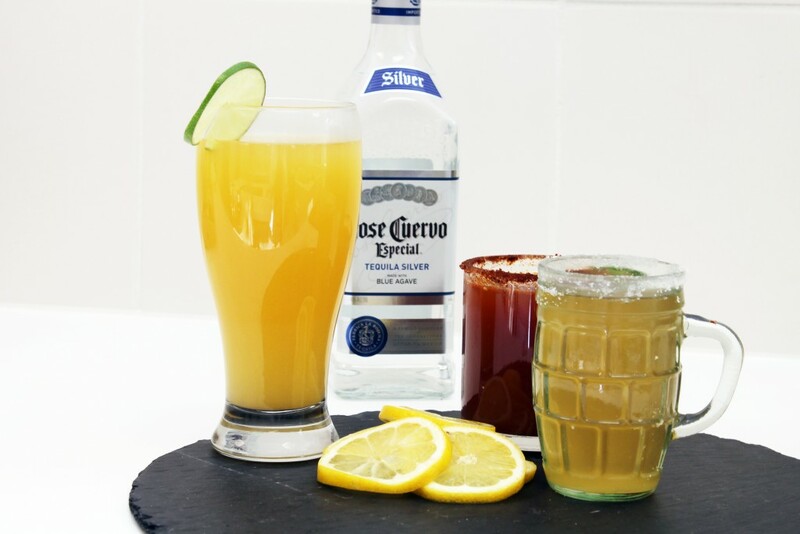 Mix 1 part tequila, 6 cold cervezas, (such as Monterrey Light Cerveza) lime juice and orange juice to taste. Garnish with sliced limes. A satisfying, citrusy cocktail. Salt the rim of each glass; fill each glass with ice. Pour one Monterrey Cerveza into each glass, pour in lime juice to taste, garnish with sliced limes. Chelada meets Bloody Mary. In a large pitcher combine equal parts chilled tomato juice and chilled Monterrey Cerveza. Add hot sauce, Worcestershire or soy sauce, and lime juice to taste. Add ice, stir. Serve in salt rimmed glasses with lime wedges for garnish. For a spicier take on this cocktail, mix 2 tablespoons salt, ½ teaspoon cayenne pepper, 1 teaspoon chili powder and ¼ teaspoon cumin. Use agave nectar or honey to coat the rim of each glass and use your salt and spice mixture to rim each glass. Garnish with slices of jalapeno and lime. A light, crisp and refreshing mix; perfect for a hot summer day. Mix equal parts ginger ale and Monterrey Light Cerveza, add lime juice to taste. Serve over ice; garnish with sliced limes. Great for barbecues, picnics or tailgating. In a beverage dispenser, combine a cold 6 pack of Amber Ale or Pilsner, fruit juice to taste, and citrus soda or sparkling water. To make things more festive, add in some fruit such as diced pineapple, lemon slices, lime slices or orange slices. An all grown-up version of my favorite childhood drink. 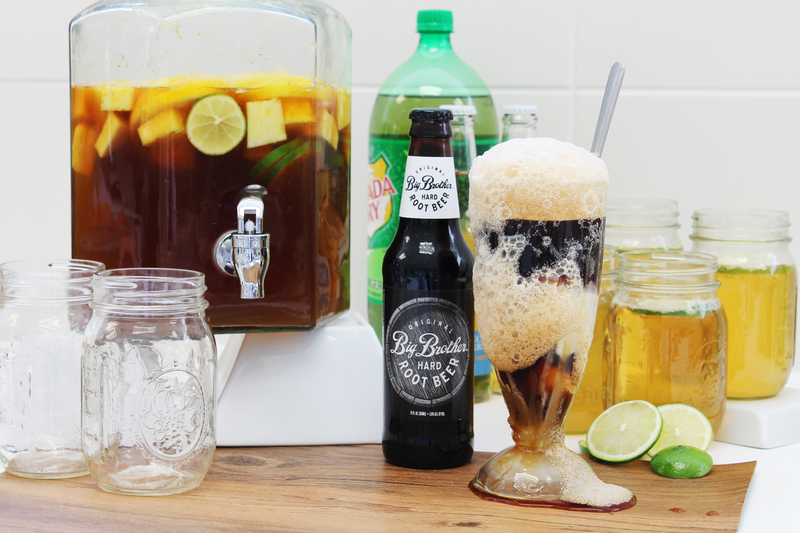 In a large glass, scoop 1-2 scoops of vanilla ice cream, pour 1 bottle Big Brother Root Beer into glass. Need it to be Dairy free? No problem. In a small pot, over high heat, heat ¼ cup sugar and ¼ cup water. Stir in 2 tablespoons vanilla and ½ cup almond milk, remove from heat. Pour mixture into ice cube trays, freeze. Add 2-3 cubes to a glass, top with 1 bottle Big Brother Root Beer. 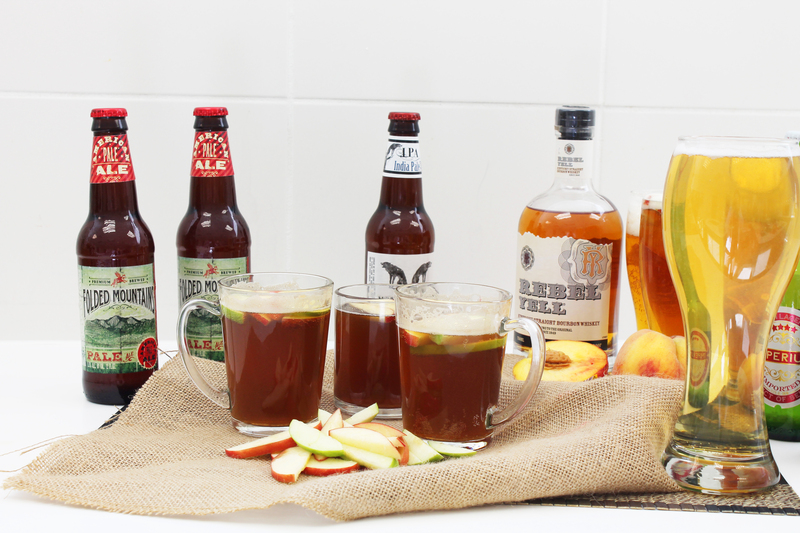 For even more inspiration, check out Chef Linsey’s Bourbon Apple Beer Cocktail or Chef Audrey’s Not Your Mama’s Cider. Add your ideas in the comments below! 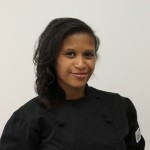 F or Chef Morgan, cooking is a family affair; her father, oldest brother and sister are all chefs. 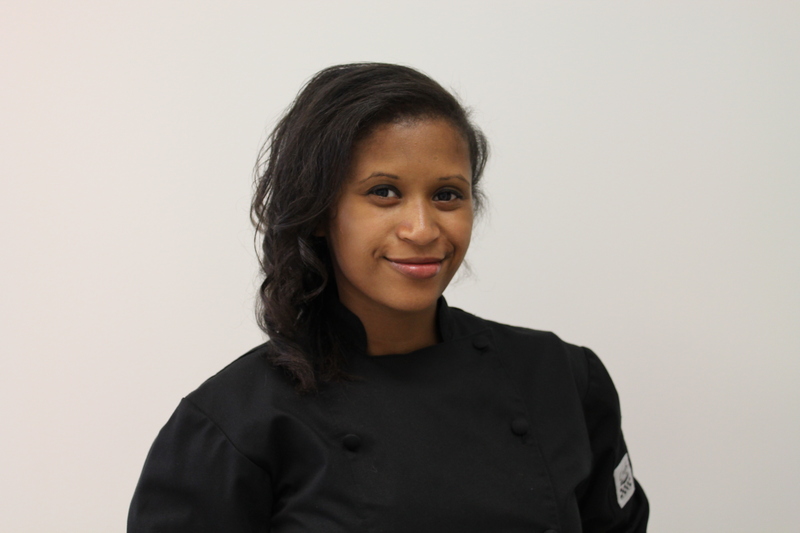 A graduate of Robert Morris University’s school of Culinary Arts, Chef Morgan’s industry experience includes everything from casual quick service restaurants to hotels to fine dining. She feels cooking can be an exciting adventure and enjoys combining ordinary ingredients in an unexpected way to make something new, fresh, delicious and wallet friendly. She believes that food should taste good and be good for you, but the occasional indulgence is a satisfying reward. Living her life with dietary restrictions, she creates dairy-free recipes whenever possible. In her free time she enjoys working out and spending time with her pug, Porky. Do you have a good easy sangria recipe? Do you have something alike Pisco Sour? I just wish that we could get all the wines and beer at our Aldi ‘ in Fultondale,, Al. All the t others in our area has them but not here, just keep getting different answers from Aldi. Hi Stan! We’d love to raise a toast with you but due to some state and local laws, not all stores sell wine and beer. We don’t want to leave you high and dry though so we’ll keep working to offer our full product line at all our stores. To see if your location sells wine or beer, visit our store locator here: http://bit.ly/1UD3kxE. Cheers! You need to include Beer-ga-Ritas, one of our favorites. Beer, limeade, and tequila. Hi Connie! We’ll keep working on getting licenses to sell wine & beer at locations near you. Thanks for your feedback!